There's really no one "right way" of cutting and sewing sweater knit fabric. Always let your preferences and experience guide you. If you have no experience sewing sweater knits, these tips will help. Before cutting your fabric, prep it by laundering it the same way you'll launder your finished garment. Sew a wide zigzag along all raw or unfinished edges before washing. Many knit stitch patterns have a one-way design. Be sure to make note of the direction of the stitch pattern before you begin to place the sewing pattern pieces on the fabric. In other words, if your sweater knit has a one-way design, treat it like a napped fabric. There are much better results when cutting a garment flat, rather than placing pattern pieces on the fold. It makes matching stitch patterns easier too. Use a ballpoint (sometimes called "jersey") needle of appropriate size when sewing. Consider sewing with polyester thread. It stretches just a little and is stronger than cotton. Use a stretch stitch or narrow zigzag stitch when sewing seams. Try not to stretch a raw edge too much. Instead fold the edge over several inches first and then stretch the folded edge to test stretch and recovery. 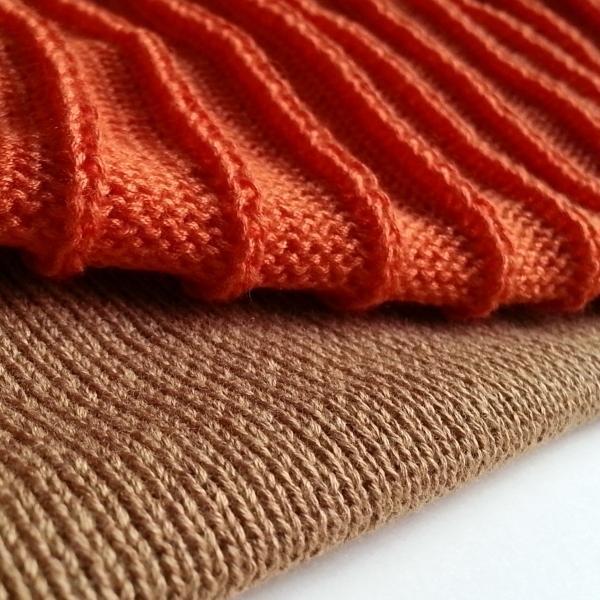 Raw edges can fray or run with sweater knits. (See above about not stretching too much.) There are several ways to finish a raw edge with a regular sewing machine or an overlock machine. Practice your finishing methods on your cutaways before you begin to sew your garment. If adding a rib band, read Determining the Length and Width of Rib Bands for helpful tips. Use the “Search” feature at the top of the right column (desktop/laptop view). Perhaps there's a post on your topic. Feel free to ask a question in the comments. When it comes to fit, sweater knits are forgiving in many ways. Relax and have fun! For a systematic step-by-step approach to cutting and sewing all kinds of sweater knits, please join the mailing list for my online course How to Cut and Sew a Sweater. The course will open again soon for registration.